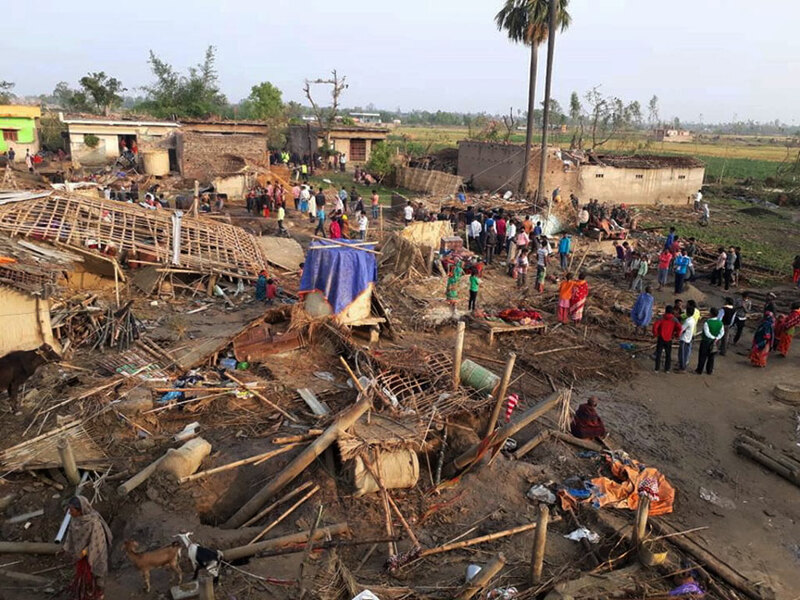 KATHMANDU: A 30-knot wind storm known as gale, probably the first in Nepal, hit Bara and Parsa districts killing 28 and injuring over 500 people, according to the Department of Hydrology and Meteorology. At 30 knots, gale, a classification of wind speed according to the Beaufort scale, blows at 15 meters per second or 55.56 kilometre per hour. Gales occur when air rises quickly and is heated by warm water. As the air cools down again, it is pushed aside by more warm air rising below it. This cycle causes strong winds. Gales are moderately high waves of greater length and generally breaks twigs and trees. The Department of Hydrology and Meteorology said that they are awaiting details of the weather forecast after the automatic weather station’s server at Parwanipur went down. “We can tell more about the weather pattern once our server is restored,” Mean Kumar Aryal, a meteorologist said. He added that while the DHM had cautioned of pre-monsoon rainfall in the southern plains, the abrupt weather change went a miss due to limited technology. “We do not have sufficient technology to forecast weather for three days. We have equipment for rain forecast and we’ve recently installed lightening forecast systems. However, we do not have sufficient to measure wind,” Aryal said. He added that they were tracing multiple modules to understand weather patterns. According to the BBC Weather Forecast, the similar weather pattern is likely to reoccur on the lower and Eastern belt until tomorrow evening – a weather pattern that Nepal’s DHM has verified. “A similar storm could reoccur but we cannot pinpoint at the location,” Aryal said adding that much would depend on atmospheric pressure and heat. He added that the pre-monsoon would continue to bring wind, thunderstorm and rainfall in different parts of the country.